Porchetta is a whole pig, roasted, and is one of the most common street foods in Central Italy. Just about every fair or gathering will have a Porchettaro who does a brisk business selling sandwiches, and also packets of sliced porchetta to people who want to take some home. There are two major traditions, one more Tuscan, and the other from the regions of Lazio, Umbria, and the Abruzzo Marche region. This recipe is Tuscan. 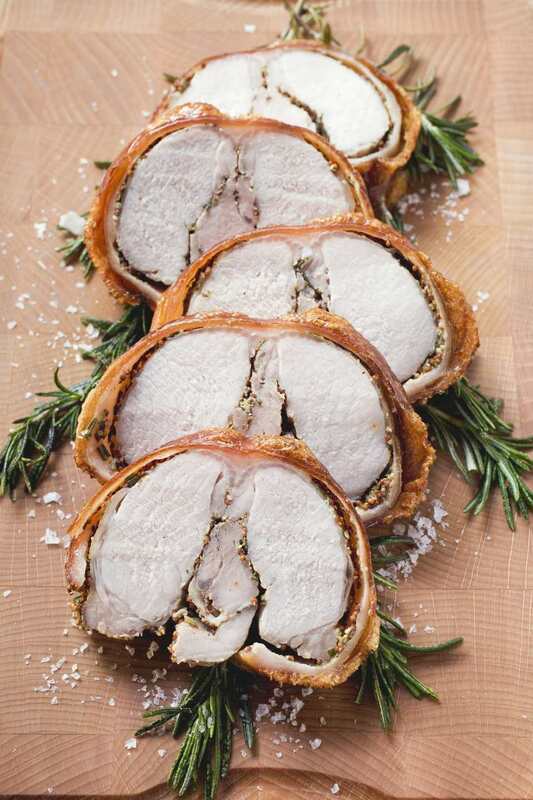 Given the amount of meat involved and the time that roasting will require, preparing a porchetta is not something one simply decides to do, and you should attempt it only if you have a certain experience with this sort of cooking. And you will need an oven large enough to contain the pig. Italians generally use large wood-fired ovens for this task. Other herbs of choice, which will vary according to the season and the porchettaro. Everyone has a secret ingredient, for example, bay leaves or rosemary. Begin by scalding the pig's hide and scraping away bristles. If you buy your pig from a butcher (as opposed to a pig-breeder) it will likely already have been cleaned. If you clean it yourself, set the organs aside for other uses. Some porchettari coarsely chop the liver and the heart and mix them in with the spices. The next step is to bone the pig, removing leg bones, shoulder bones, rib cage, and spine. Leave the skull in place, and also, if you want, the tail. Wash and dry the cavity. Distribute the spice mixture evenly throughout the cavity of the pig, making certain it reaches the hollows left by the bones and between the muscles. Be patient, and thorough, because the success of the porchetta depends upon seasoning the meat evenly. Mix together the rest of the ingredients for the spice mixture. Tuscans do not use wild fennel as southern Italian traditions do, which is a difference between the two. Make cuts through the rind into the meatier parts of the pig and rub spice mixture into those cuts. Distribute the spice mixture evenly throughout the cavity of the pig, making certain it reaches the hollows left by the bones and between the muscles. Be patient, and thorough, because the success of the porchetta depends upon seasoning the meat evenly. The cuts through the rind will allow fat to drain as the animal roasts, and help heat penetrate. While you are preparing the pig, you should also heat your oven; it should be fairly hot (360 to 400 F, or 180 to 200 C). Put the trussed pig in the oven, on a spit turner, and over a pan that will serve to catch the drippings. Porchettari figure an hour's roasting time for every 10 kg of pig, so a 100 kg (220 pounds cleaned) pig would take 10 hours to roast. Check it and baste it occasionally. The porchetta is ready when the rind has turned a pretty golden brown, and a skewer inserted into the deep muscles comes out clean. Porchetta is served thinly sliced, either warm or at room temperature, with the rind, which is delightfully crunchy, and is perfect as a sandwich filler or as a picnic or cookout food. The texture of the porchetta, since it is a whole animal, will vary from place to place on the roast pig. The shoulder area is fairly rich, the hams are drier and firmer, while the stomach area will be moister and a bit fatter. In short, something for every taste. The wine? Red, and lively, with nice acidity to balance the richness of the meat. Examples? Bardolino, Dolcetto, young Chianti, Rosso Conero, and Negroamaro.